So you’ve bought this amazing chunky necklace that you just can’t wait to show off. But your fashion sense might fail you if you try to don that awesome accessory on camera. Jewelry, watches and even adornments on clothes (bedazzling anyone?) can cause unwanted distractions, taking away unnecessarily from your on-camera performance. Necklaces can offend on-camera audio in multiple ways. If they are made up of several strings, they can create sound when they rub together, which can easily be picked up by the microphone. Direct hits can happen, too. A necklace and mic collision cannot be edited out. 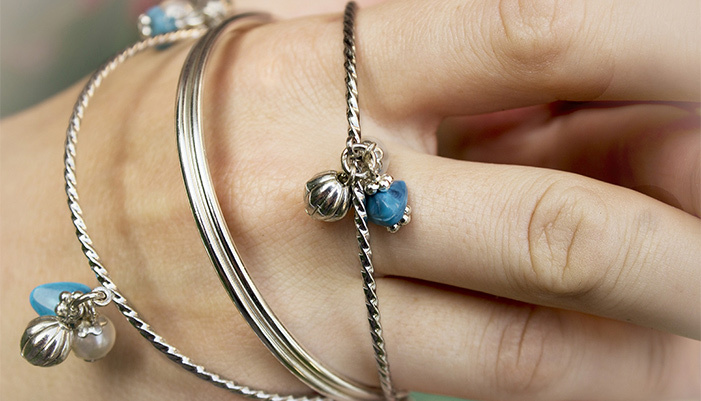 Bangle bracelets should also stay in the jewelry box. Their clatter has no place on set. One unlikely enemy to the on-camera performer is a watch. If you are sitting at a desk and gesturing, you can inadvertently knock your wrist against the tabletop. The microphone can pick up the clank. The same is true for buttons on the sleeves of some blazers. Seek to keep your wrists off the desk to avoid creating extraneous sounds. While newer smartphones cause far fewer headaches for audio engineers than their earlier mobile counterparts did, you don’t want your phone to be the one that somehow does create a stir. After all, do you really think you will answer a text or phone call in the middle of an on-camera performance anyway? Audio issues are not the only interference jewelry can make. Light loves to bounce off metal and other shiny materials. Avoid pieces that may shimmer, glint, or reflect whatever light source you are using. Flashes or sparkling splashes should be reserved for the dance floor, not your video. Also, carefully consider what you adorn your ears with. While dangling earrings won’t create noise, they can create a visual distraction if they swing about in rhythm to your head movements. Accessorizing also follows the rule of “Boring is Better.” Keeping it simple will ensure your audio is clean and your audience will stay focused on the message, not your dancing, dangling earrings. If you found this information valuable, check out my book, On-Camera Coach: Tools and Techniques for Business Professionals in a Video-Driven World, now available from Wiley Publishing. On-Camera Coach aims to take the mystery out of communicating through the camera and provides specific tips and techniques that can make your message sing—and you, the messenger, feel confident in a job well done. For the business executive of today—and surely of tomorrow—being able to communicate through a camera is an essential skill. It's powerful. It's immediate. It's often necessary to reach global audiences. ©2017 Speaker Dynamics, LLC. All rights reserved.